The Fun Begins the Minute You Give Us a Call! With over 3,000 miles of cooling trade winds, it’s no wonder that sailing is one of the Eastern Caribbean’s greatest natural resources. It will be difficult to choose among France Italy, Spain, Greece or Turkey. Each country you visit offers highlight after highlight. North American Charters offers places like New England, Florida, Gulf of Mexico, California, the west coast and Alaska. With a superb tropical climate from March through November, fanned by trade winds, the warm waters of the South Pacific charter. What can you expect from a Nicholson Charter? Cmdr. Vernon Nicholson, O.B.E., R.N. Pearly pink dawns, sunlit afternoons and soft, balmy evenings; the aroma of fresh coffee coming from the galley as you take a morning swim; the pleasures of having an attentive and knowledgeable crew; the freedom of having your own yacht. Go ahead—picture yourself there. You step aboard, and the dedicated crew greets you with a warm smile and a tall, cool glass. Your cabin is spacious and luxurious, with beautiful décor and an ensuite bathroom. As you unpack, your yacht tugs at its anchor, ready to whisk you off to exotic places. As the days unfold, you cruise from one beautiful anchorage to the next, from one new adventure to another. In some areas, where the islands are close together, you can visit several anchorages in the same day. In fact, you will surely miss something if you go below. But this is a vacation, a relaxing time. 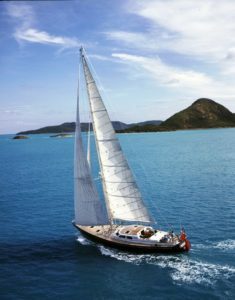 There is no set schedule on our private luxury yacht charters—you can go anywhere you like, whenever you like, and spend as much time underway or at anchor as you like. One day, let your crew arrange a beach barbecue or a picnic by a waterfall. Another day, how about a sightseeing excursion to historic sites, quaint villages and colorful markets? Your Nicholson Yacht Charters crew knows where the best shopping is, too! Don’t forget to stop at a local pub for a refreshing rum punch. A game of golf or a rendezvous dive? Just ask. There’s always time for beachcombing and snorkeling aboard our private yacht charters—or just reading a good book while you work on your tan. Each day, you savor delicious meals prepared especially for you by your chef. All you have to do is enjoy.